The Selsey Community Bus first took to the streets of Selsey in September 1996 and it continues to go from strength to strength. From those first days, when 30 passengers a week was unusual, now at least that number use it each day. The service runs on Monday, Tuesday, Thursday and Friday mornings, covering the outlying areas of the town, bringing people into the centre to shop, attend the doctors' or dentists' surgeries, or to catch the Stagecoach bus into Chichester. There is a "dial-a-ride" service into Chichester on Wednesday afternoons, visiting the shops, the leisure centre or the hospital; and also a service to the cemetery at Church Norton on the second and fourth Monday afternoons of each month. 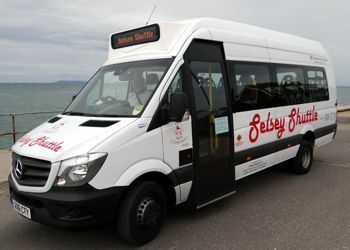 After 13 years' sterling use, the original "red bus" was replaced and the current vehicle has been re branded "Selsey Shuttle" reflecting the services in and around town. Obviously passenger fares alone do not pay to keep the bus on the road, so along with local authority support, the bus is hired out to local groups for evening or weekend use at a very competitive rate. Voluntary donations are also very welcome to keep the wheels turning. The drivers are all volunteers and new recruits with a couple of hours per week to spare are always welcome. Please contact the Co-ordinator on Selsey 605353 for further information.